Which décor tribe do you belong to? This low-set look (above) epitomises the boho chic of party island Ibiza. 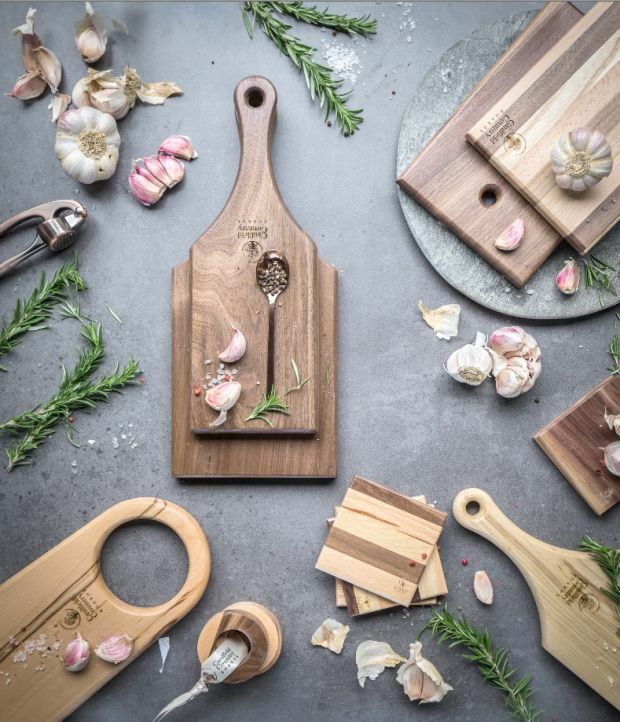 For inspiration head to Home Sense (homesense.com), which has just opened in Westend Shopping Park in Blanchardstown and on The Mall in Cork city. This fringed parasol, €199.99 will look good and keep the sun off. 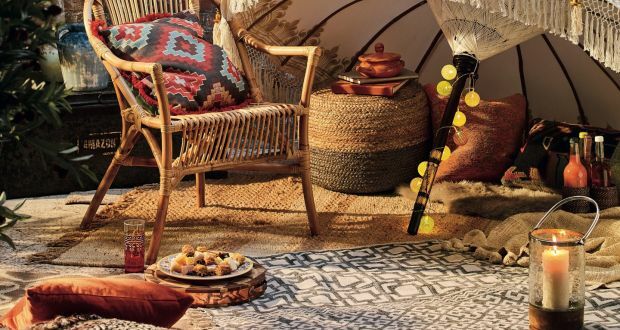 Tribal cushions cost €12.99 each, the bamboo chair costs €69.99 while the woven footstool, which can double as a side table, costs the same price. The sundrenched colours of the Indian subcontinent will help brighten any sun-bleached garden furniture. 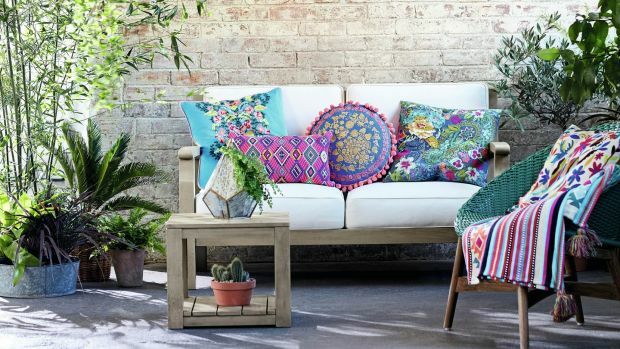 Embroidery on brightly coloured cushions gives an additional sense of texture as these four designs from Marks & Spencer demonstrate; a folk-inspired motif, €34; a small rectangular diamond-patterned shape – good for lower back support, €34; a round pom-pom-fringed design, €34; and a Paisley square, €47.50. 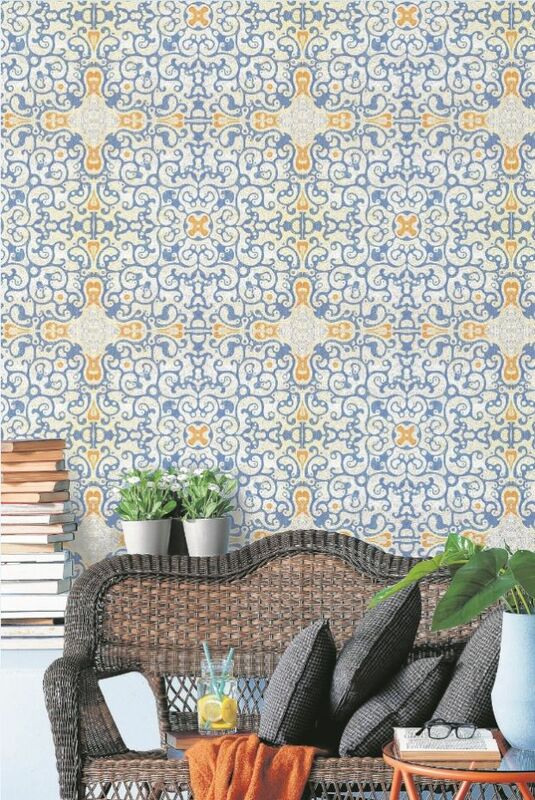 The repeat pattern of this Newmor (newmor.com) Tribe wall covering, from about €41 per square metre, is inspired by Mayan Riviera, the playground of California’s movie business. The sombre effect works well in a bedroom with a low-set bed especially if you carry the theme through to the bed linen. 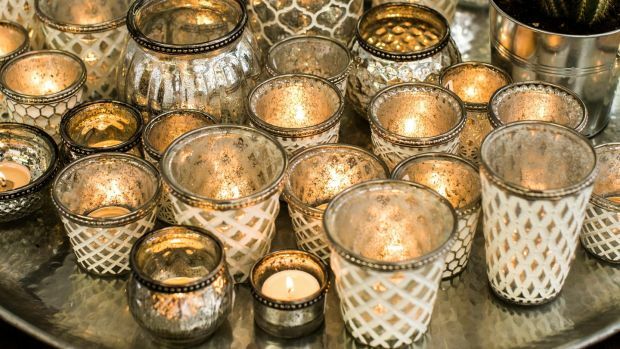 Add a gorgeous glow to your indoors or outdoors with Capri tea light holders from One World (one.world). Being silver-lined they exude a gorgeous glow from within and if used in abundance, as pictured, can replace the need for any other form of lighting. They cost from about €5.00 each. If your destination is Morocco this summer you will find similar styles in the local souk. If that number of tea lights is too much of a faff for you then The Drawing Room in Dublin’s Westbury Arcade sells a large gold hexagon lantern that will create the same sort of effect. It costs €66. And Article Dublin, in the Powerscourt Town Centre, sells another nice option, perforated ceramic tea lights that will diffuse the light with shadow play. There are two designs each costing €5.50. 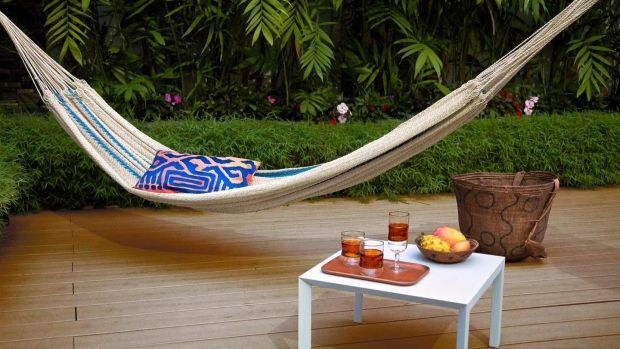 This traditional ‘chinchorro’ or hammock is handwoven by Jivi men and women, nomads indigenous to the Amazon. Made from fibre of the moriche palm, found on the banks of the Orinoco River it is as easy to sling between trees in the dense jungle as it is in your own backyard, and costs €320 from UK-based Maison Numen (maisonnumen.com). 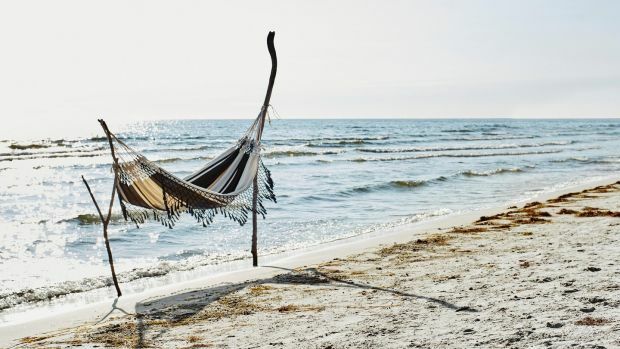 Hanging in this polycotton design, about €174, ex delivery from German-based My Adele (myadele.de) long enough and you may just mystically transport yourself to the gorgeous beaches of Goa. Be true to your boho brethren with the Tribe collection from House of Fraser (houseoffraser.co.uk). 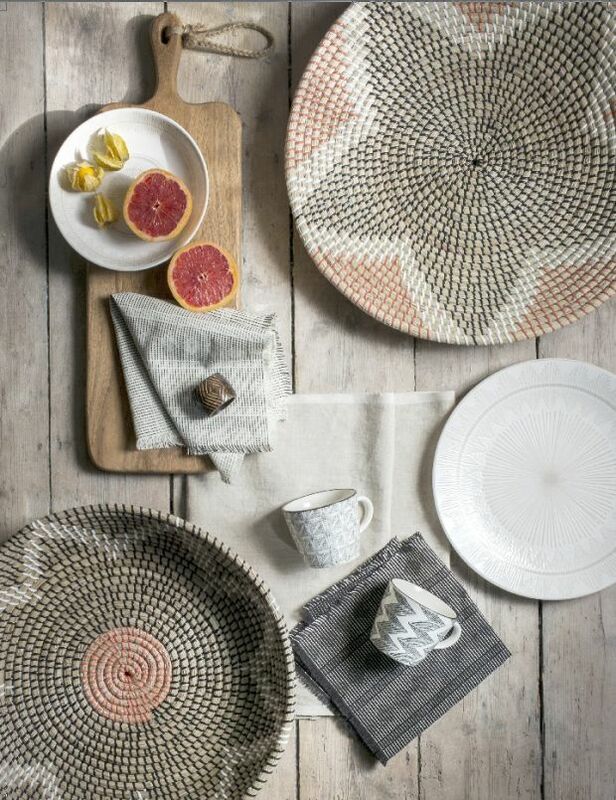 There are napkins, about €18 for a set of four; side plates €7 each, pasta bowls €9.50 each, square and zigzag patterned mugs €5.50 each; For baskets try Etsy (etsy.com) where a large selection of dried banana leaf designs from Uganda cost about €88 each. Stock on South King Street also sells a small selection of plain designs with prices from €10 to €40. 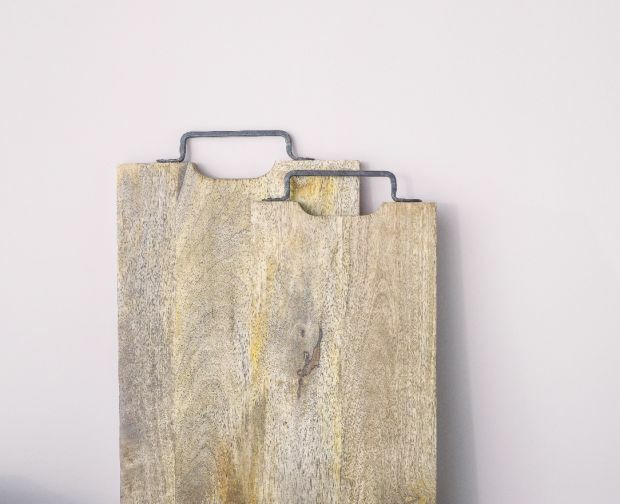 You may find rustic boards made of mango wood, from just €9, in your local branch of Heatons Stores (heatonsstores.com) but if not another affordable option is a smart rectangular board with a leather-look strap that you use to hang it from when not in use, €15.50, at Next (Next.ie). A rug brought home from travels abroad is a souvenir that lets you feel and experience that place every time it is underfoot. A classic super-size Beni Ourain rug from Irish Moroccan specialist online store Dar Sol (dar-sol.com) has been hand-woven using sheep’s wool that is free from natural dyes and chemicals and is really a testament to natural fibres. 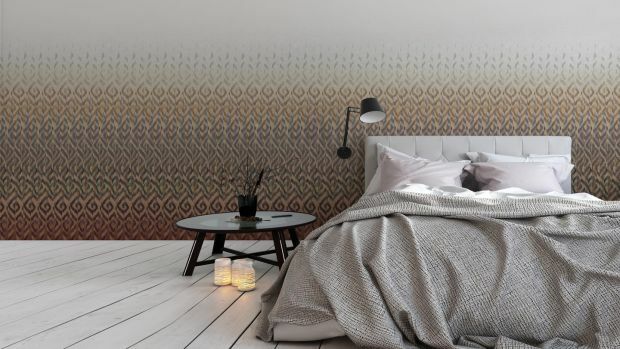 Measuring 300cm by 200cm it has a mid-high pile that feels sumptuous beneath your feet and has a brown geometric pattern woven within it, to complement most decors. Buy before June 30th and you can get €100 off this or any other rug on the site.